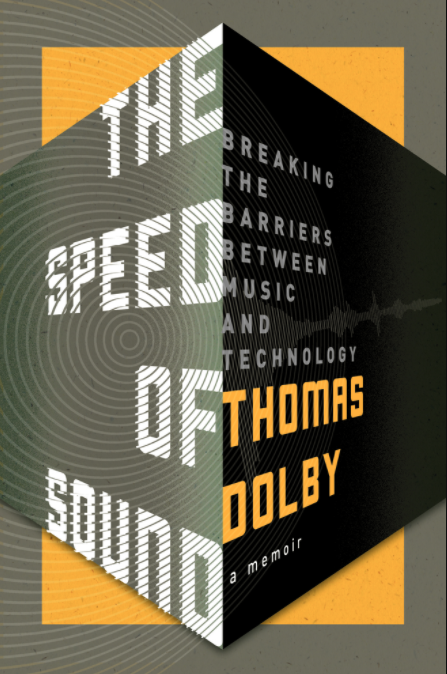 During Thomas Dolby’s 35-year career in music: he earned Grammy Award nominations for his work, including one for Producer of the Year; he blazed a trail for electronic music; and, he recorded with Foreigner, Def Leppard, George Clinton and Joni Mitchell. He appeared live with Stevie Wonder and Herbie Hancock at the Grammy Awards, and at Live Aid with David Bowie. He wrote “She Blinded Me With Science” that became a Top 5 Billboard hit that went on to become an anthem of the 1980s and he wrote original music for feature films produced by George Lucas, Steven Spielberg and Ken Russell. Dolby also created music and soundtracks for computer games including Siberia (PC), Grand Theft Auto (Playstation), Double Switch (Sega), Obsidian (MacOS), Toadlickers (iOS), and The Dark Eye (CD-ROM) and originated the first-ever music-oriented Virtual Reality installation, The Virtual String Quartet, at the Guggenheim Museum in New York in 1993. He is the holder of multiple patents in the field of interactive audio. 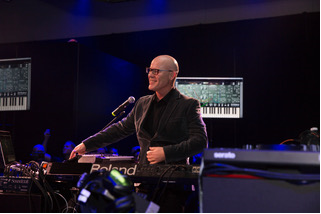 Thomas Dolby will lead the Johns Hopkins’ Peabody Institute’s Music for New Media program slated to enroll its first students in the fall semester of 2018. Since 2014, he has been the Homewood Professor of the Arts at Johns Hopkins University and he released his memoir, The Speed Of Sound, in 2016. Stay Thirsty Magazine was privileged to visit with Thomas Dolby for this Conversation about his career, the future of music and the role of education in the next wave of music innovation. STAY THIRSTY: You are known for your hit songs “She Blinded Me with Science” and “Hyperactive.” They were the first of many successful singles and albums in your career. Looking back, how important was achieving success so early? 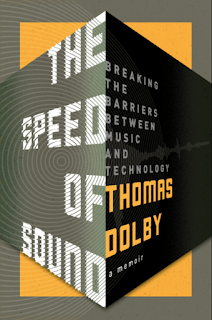 THOMAS DOLBY: Vitally important, because it's what opened so many other doors for me. After the hits, I got approached by a myriad of different people – needing synth playing, production, film scores and so on – and it led to a diverse and varied career. STAY THIRSTY: You are also known for your early involvement in music’s “new wave” movement. Who were the influences back in the 1980s that contributed to the development of your sound? THOMAS DOLBY: My sound owed a lot to Kraftwerk, Brian Eno, Bowie, Prince, George Clinton ... but also quirky individualistic songwriters in many different genres such as Frank Zappa, Van Morrison, Dan Hicks, and Joni Mitchell. STAY THIRSTY: In 1985, you performed at the Grammy Awards with Stevie Wonder Herbie Hancock and Howard Jones. What did that experience teach you? THOMAS DOLBY: The road to MIDI Hell is paved with bad hairpieces. STAY THIRSTY: You also performed in Live Aid as part of David Bowie’s band. Did Bowie’s style of music have any place in your lexicon in the years that followed? THOMAS DOLBY: If anything, playing with Bowie actually exorcised that influence from my music. Post-1985 there's a lot less Bowie in my singing and songwriting. STAY THIRSTY: You have also scored movie and video games. Are there special skills required for each genre or are the techniques generally the same? THOMAS DOLBY: They're very different. In a movie you have a pre-existing linear template to work to – though it's often a moving target – and your job is to enhance the drama and emotion, the sense of time and place, empathy or suspicion of a given character, the grandeur of the landscape, etc. In a game you're looking to match the player's excitement but it's the player that dictates the pace and the action. So you have to put your movie score smarts into a real time situation. This is becoming truer as games get more sophisticated, and certainly with the arrival of VR, where it's all about being in the moment. STAY THIRSTY: Retro-futurist music, steampunk and diesel punk, noise music, jazz and dance music all seem to have a place in your head and in your creations. How do you sort this all out when you are writing new music? How organic and personal are your songs and albums? THOMAS DOLBY: There's no “sorting out” to do. I don't set out to write in a given style. Sometimes a particular musical idiom works for me as an aid to telling the story. For “Aliens Ate My Buick,” I adopted a saucy funk style to suit the “pop culture” kitsch of the songs, whereas on my last album, songs like “17 Hills” and “Toadlickers” needed more of an Americana feel to them, to help tell very middle American-flavored stories. STAY THIRSTY: How do you view “roots music” and what is its role in contemporary music? THOMAS DOLBY: Certain kinds of music are definitely “indigenous” and seem to belong in a particular locale or era. For example, steel drum music started because the British littered the Caribbean with empty oil drums and the locals picked them up on the beach and started hitting them. Some African music stemmed from the use of drums to carry messages long distances. Okay, that's very nice for the musicologists. But there's also a type of music that belongs in Liverpool in the early Sixties, or San Francisco in the Summer of Love, Seattle in the 90s, you name it. Some music is made as part of a localized upswelling, other music (e.g., mine) defies all those categories, because I prefer to have the freedom to dabble in lots of exciting music styles. Still, I respect people who were part of a movement, and sometimes I envy them. The closest I came is to the underground DIY electronic music scene out of London and Sheffield in the late 70s. It was a reaction to the garishness of punk rock and to the big corporate labels. STAY THIRSTY: In the fall of 2018, you will be heading up the Peabody Institute’s Music for New Media program. How did this come about and what are your goals? How necessary is it for music students of today to know about the “new media” currently in use and being developed in order to better navigate their musical careers? THOMAS DOLBY: The Peabody Institute is one of the finest conservatories in the country, and for years it has turned out brilliant classical musicians. But there are simply not enough jobs in professional orchestras. Conversely, in TV, movies, games and VR there are lots of opportunities for sound and music experts, and many of those seats are currently being filled by people who like me are enthusiastic and creative but not trained in the fundamentals of music theory, sight reading, orchestration, etc. When I started out there was nowhere to go to study this stuff, so I graduated from high school at 16 and went it alone. Even today there are few people qualified to teach it, plus it's a rapidly evolving landscape. However, I have real-world experience and I have constantly encountered new challenges, and treated them as an opportunity to express myself musically. That's what I want to rub off on my students in the new degree course – a willingness to creatively problem-solve, and to delight and entertain. In five or so years these students will go out into the workforce and be equipped to take on those challenges, regardless of what twists technology takes. By then we might be getting lasers shot into our eyeballs, or smart contact lenses and spatialized audio ear buds; or maybe we'll all be jacking into the Matrix direct; but my students will know how to make the experience better with great music and sound.